Fort Shantok: “The site of an historic Mohegan Indian fort, village and burial ground off Route 2A in Montville, Fort Shantok is on the National Register of Historic Places and is a National Historic Landmark. 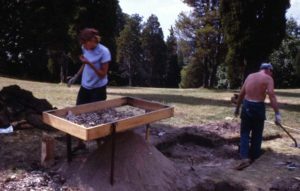 The site was excavated in the 1960s and early 1970s by New York University under the direction of professional archaeologist Dr. Bert Salwen, professor of anthropology at NYU. The Fort was the center of Mohegan tribal authority during the 17th and 18th centuries and the scene of a number of important events in the tribe’s history, including several significant meetings between English leaders and the famous Mohegan sachem Uncas. The manufacture of wampum at Fort Shantok probably helped promote the Mohegan tribe and its sachem Uncas’ political rise and strong alliance with the English at the expense of other tribes. Under Uncas’ leadership, the Mohegan entered into several Treaties with the English and during the Pequot War of 1637 Mohegan warriors joined with English troops and their indigenous allies to help defeat the powerful Pequot. Archaeological evidence found at Fort Shantok provided important insights into indigenous cultural change and adaptation as a result of Mohegan-European contacts. Many items were bartered from Europeans and adapted by Mohegans for use in traditional activities. For a time Fort Shantok was a Connecticut state park, but after the Mohegan tribe was officially recognized by the National Park Service, the state of Connecticut returned the land to the tribe (Lavin 2007). 2007 Connecticut Connections: Places to go to Learn about Historical Archaeology, Connecticut History. 1970 Cultural Inferences from Faunal Remains: Examples from Three Northeast Coastal Sites. Pennsylvania Archaeologist 40(1-2)1-8. 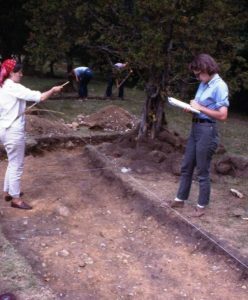 1972 Fort Shantok and Fort Corchaug: A Comparative Study of 17th Century Culture Contact in the Long Island Sound Area. Ph.D. dissertation, New York University, University Microfilms, Ann Arbor. 1997 Fort Shantok National Historic Landmark. Bulletin of the Archaeological Society of Connecticut 60:29-42. Fort Shantok also provided important insights into indigenous cultural change and adaptation as a result of Mohegan-European contacts. Shown here are several items bartered from Europeans and adapted by the Mohegans for use in traditional activities. Distinctive early post-contact Mohegan pottery called Shantok Incised by archaeologists. Some archeologists believe that the pottery style is a cultural marker for the Mohegan/Pequot peoples, who prior to the 1630s had comprised one tribe. Others believe it represents an extra-tribal social group that inhabited southeastern New England. Note the designs resembling corn ears and female genitalia, which some archaeologists interpret as symbolizing both food and tribal fertility in a time period when Indian peoples losing their political independence, economic success, and experiencing great population losses caused by European diseases, wars, and poverty. Shantok was a center of wampum manufacture, an activity that could generate wealth, social status, and political power and which probably helped promote the Mohegan tribe and its sachem Uncas’ political rise and strong alliance with the English at the expense of other tribes.